With these cards, play all the old, familiar games with a new, unfamiliar twist: they're huge. Sure, you talk a big game, but can you handle the big cards? Ask your casino party guests this question just before you whip out these outrageously oversized cards, and laughter will kickstart the party mood. 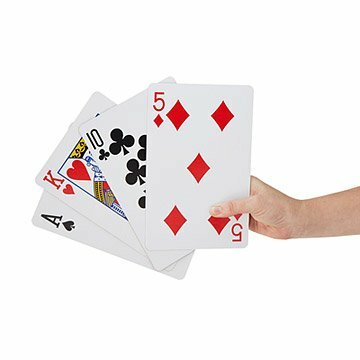 At about 8.5" x 5.5", dealing, holding, playing, and especially shuffling them will add fresh challenge and fun to games you've been playing since forever. (On the other hand, for the vision-challenged, they'll make playing cards easier.) For indoor or outdoor use, this super-sized deck will build a house of cards so big, you might have to pay real estate taxes on it. We hope your poker game is good enough to help with that. Made in China. Totally fun and would buy again! This is a Christmas gift, excited for them to use them! This was the perfect gift for a man who is hard to buy for and loves to play cards. I bought the giant deck of cards for my fiancÃ©'s birthday. He likes really out there stuff nobody else has. He also collects decks of cards so these are great. All my friends are turning 50 and love to play cards, once the birthday girl opened the gift it was the hit of the party. Provided lots of laughs! I would buy this product again. Fun and Enjoyable! Fun gift. Probably not meant to be used by those who are hard of seeing. They are too big and unwieldly. But sure my parents will bring them out as a "fun" game with their older friends in the retirement community.